(Aug 20): Bersih 2.0 has challenged Datuk Seri Najib Razak to allow its rally calling for his resignation to go on unhindered next week, so that the Prime Minister may gauge for himself the extent to which the public supported him, or not. 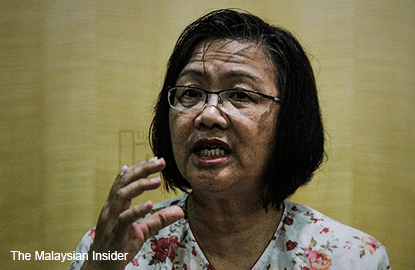 If the rally fails to gain traction, then he can consider it as a public mandate for him to continue his administration, Bersih 2.0 chairperson Maria Chin Abdullah said in a forum last night. "If we are not able to gather many people at Bersih 4, then Najib can say, 'I have allowed Bersih 4 (to gather) and I shall continue to remain in power until the 14th general election'. "Right now, I propose that Najib allow us to prove whether Bersih 4 will succeed or not. "If we fail to attract many people, Najib can carry out his institutional reforms. "Or Najib can allow a motion of no-confidence be tabled in Parliament," Maria said during the forum "Bersih for All" at the Kuala Lumpur Selangor Chinese Assembly Hall last night. Her challenge came hours after police said it would not allow the rally to proceed on August 29 and 30 in the capital city as the organisers have not replied with a notice to hold the gathering. Bersih had previously stated that participants would gather near Dataran Merdeka, and vowed not to disturb Kuala Lumpur City Hall's (DBKL) Merdeka Day preparations. Police later requested that the organisers change the rally's location, saying it was not suitable. Yesterday evening, Kuala Lumpur police chief Datuk Tajuddin Md Isa was quoted as saying that the organisers failed to abide by the Peaceful Assembly Act 2012. He said the police were only notified of the rally yesterday, and the documents handed in were missing a permission form from the owner of the rally location. "They can send in their documents any time before the date of the rally. After we receive it, only then will we consider their request," he was quoted as saying by Bernama. Maria told the forum last night that the rally would be festive, as several musicians had contacted Bersih expressing their interest to perform throughout the gathering. Kuala Krai MP Dr Mohd Hatta Ramli who was also speaking at the forum, reminded the public to prepare themselves and ensure they had enough energy for the 34-hour rally. He said it was different from the 2013 Bersih rally, which lasted just two hours. "Before this, we gathered for two hours but it wasn't 'hot enough'. "Now we will try to build it up. If we can stay there longer to show how determined we are, we are sure to send a message," said Dr Hatta. The Bersih 4 rally will also be held in Kota Kinabalu, Sabah and Kuching, Sarawak as well as major cities worldwide.